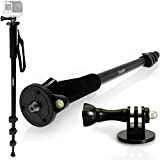 iGadgitz 160cm 4-section monopod with 1/4 and 3/8 inch screw thread and mount for attaching GoPro Hero5 Black, Hero5 Session, Hero4, Hero3+, Hero3, Hero2, Hero1, Hero Session action video cameras. Comfortable foam grip handle with wrist strap for easy transportation. Quick release leg locks for adjustable height between 20.6″ (52.5cm) to 63″ (160cm). Bubble level for fine adjustment. Non-slip rubber foot ideal for any surface. The padded foam grip and rubber foot help maintain a solid grip on the monopod, and the wrist strap provides extra security whilst hiking or climbing. With four section aluminium legs that can extend from 52cm to 160cm in no time, you can be assured that you won’t miss your shot! The fortified constructed aluminium tubes ensure additional stability for a creative and enjoyable shooting experience. Supplied with a carrying case for easy transportation.